Yes! Under the amendments to Evidence Act, Section 114A, you, me, he, she, that guy, your grandma, my dead uncle, your lost dog, angry bird, lobster, imaginary friends... ! All presumable guilty until proven innocence! It is scary, distress and horrible! Somebody, anybody can use my name, post something menacing, i am as guilty as charged, and have to prove my point innocence. In this hackable world, how on earth for somebody to prove their innocence adding to such amendment? A definite threat to freedom of expression and media freedom. What about the Fundamental of Human Rights? The principle of one is considered innocence until proven guilty! 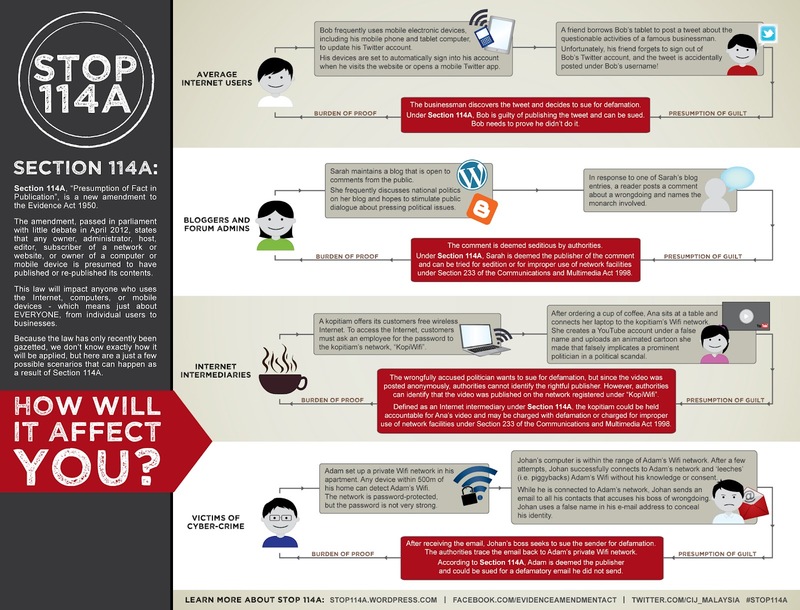 The Amendments to the Evidence Act Section 114A are a threat to Internet Freedom in Malaysia and a concern to anyone producing content online (excerpt-ion from here). And how does this affect you? and here what you can do. You and I could be victimized from the Amendments, #Stop114A. I'd done my part. You should too. Check Resources here.